3 bedroom 3 bath waterfront vacation rental with dock and party deck! A beautifully decorated home, the Beechwoods Home is pet friendly and boasts three bedrooms all with king beds, a fourth sleeping area with a double bed, and three full bathrooms. The large deck off the master bedroom, kitchen, and living room overlooks the most gorgeous long, wide water views of the lake. Beechwoods has a great dock with electricity, a party deck, small bar and refrigerator plus a large floater to tie your boat to. Sun, swim, fish or just relax on the dock and for those rainy days there are plenty of activities such as board games, books, and an air hockey table for the children in the lower level family room. This home is handicap accessible and very conveniently located by land to Halesford Bridge by Bridgewater Plaza and restaurants and shopping. By water it is between the bridge and the Smith Mountain Dam on the Roanoke River Channel. 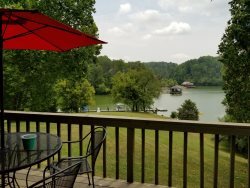 Call us today to reserve the Beechwoods home to start your Smith Mountain Lake Family Vacation memories!! We liked the house so much that we booked again. There are many things we love about the house, the 3 king beds, big master suite, well-equipped kitchen, comfy furniture, lots of deck furniture. Good dock for the boat and jet ski - I hope to be able to bring both next year. Check in at 3 pm and Check Out is no later than 10 am. We ask that you call our office at 540-721-2589 upon check out. Our housekeepers need this time between 10 am and 3 pm to properly clean and prepare the homes for the next reservation.